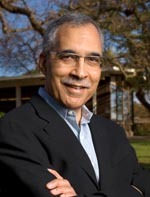 Claude M. Steele is among the most influential social scientists of the past three decades, whose social psychology experiments are well known within the disciplines of Psychology, Sociology, Education, and the Law. Steele’s work has inspired hundreds of scientific studies and generations of young scholars. Steele is best known for his research on “stereotype threat,” which identified a situational factor operating in the much-debated ability gaps between women and men in the domain of mathematics, and the broader IQ gap between blacks and whites. Its central tenet is that when people are confronted with negative stereotypes their group they can experience anxiety about confirming those stereotypes. Under specific conditions, stereotype threat debilitates intellectual functioning and performance, and over time, leads to psychological disengagement from the threatening domain. In the wake of the first published studies on stereotype threat with his students Joshua Aronson and Steven Spencer, over three hundred studies on stereotype threat have been published, numerous field interventions based on the stereotype threat formulation produced markedly improved performance among students targeted by ability stereotypes, and the research has been cited in two supreme court cases on affirmative action. Prior to this work, Steele published a landmark chapter detailing his theory of “self-affirmation,” which would become the most widely embraced modification of Leon Festinger’s theory of cognitive dissonance, social psychology’s most influential theory of human motivation. Steele’s research challenged the central tenet of dissonance theory—that people find inconsistency per se uncomfortable and have a fundamental need for consistency between cognitions. Steele argued that people are bothered not by mere psychological inconsistency but rather by the threat to self-image that accompanies inconsistent behavior. He further posited a self-system comprising self-conceptions, values, talents, and so on, which comprise a reservoir of self-resources from which people draw to restore feelings of self-integrity when self-image threats arise. This fact, Steele proposed and his research showed, gives people flexibility in responding to self-threats. Although psychologists still debate the role of consistency strivings in human motivation, self-affirmation theory firmly established itself as a staple in social psychology and as a methodological breakthrough in both basic and applied research. Steele also conducted research on the psychological effects of alcohol consumption, documenting what he referred to as “alcohol myopia, ” the effect of narrowing the drinker’s focus upon immediate events and stimuli and reducing focus upon distant events, stimuli, or thoughts. Steele showed how this narrowed focus plays a role in alcohol’s well-known reduction of social inhibitions and reduction of emotional stress. Steele was born and raised in a working class suburb of Chicago to interracial parents—his father a truck driver, his mother a social worker—who met through their involvement in the civil rights movement. He went to Hiram College and later received his PhD in social psychology from Ohio State University, where he worked with Thomas Ostrom. From there Steele took his first academic position at the University of Utah, where he stayed only briefly, leaving for the University of Washington. After Washington he moved to the University of Michigan, where he began his work on minority underperformance, and then joined the department of psychology at Stanford University. During his time at Stanford, he served as director of the Center for Advanced Study in the Behavioral Sciences, leaving when offered the position as 22nd Provost of Columbia University, the first African American to hold the post. In 2011, he stepped down from that position to accept the position of Dean at Stanford University’s School of Education. The winner of many of psychology’s most prestigious honors, Steele is a member of American Academy of Arts and Sciences, the National Academy of Sciences, the American Philosophical Society, and the National Academy of Education. He holds honorary doctorates from the University of Chicago, Princeton and Yale. An uncommonly creative experimentalist, warm and engaging teacher, and superb mentor, Steele attracted and nurtured a great number of adoring students, many of whom have become influential scholars in their own right. He is also an exceptionally clear and elegant writer, crossing the boundaries of the academy to produce, for example, widely read pieces for the Atlantic Monthly and The New York Times and, most recently, a book documenting his work on stereotype threat, Whistling Vivaldi and Other Clues to How Stereotypes Affect Us. * The FABBS Foundation would like to thank Josh Aronson, Susan Fiske, and Scott Plous for nominating Dr. Steele for this honor and for leading the effort to spread the word about his nomination. Would you like to honor Dr. Steele? It isn’t too late to have your name added to the list of donors! You can make your donation to Dr. Steele’s “In Honor Of…” campaign at any time.